White cottage // Studio shots. Hi guys I'm finally blogging again! I'm kind of losing my motivation to blog cox I don't usually blog if I don't have pictures, like one whole chunk of words who will read right ! And the amount of assignments I have is ridiculous, like 4 individual assignments with their due dates so close to each other sigh. My saturday is occupied too with Radio productions lessons and the amount of time I've left for myself is like super little. I'll try my best to blog as much as I can cox I realize if I don't blog my bloghits will decrease LOL. So on Sunday (which is yesterday lol!) I went to White Cottage (Read from Miyake's blog!) for a studio shot with Mariam (photographer of the day) and Jievanda (my super duper awesome saikang warrior!). I left Mariam's blog link above so you all can head over to her blog! She always blog super chim english one so I always go to her blog and steal quotes hahahahaha. Go make her blog hit increase also thank you lol. Jievanda blogs too but she update very little one , like me haha. The place is ulu dao even the cab driver also have no idea where is it lol and the place is like located above some senior citizen centre one... But inside quite pretty leh! There are two rooms inside the studio, one outside (like the living room) and it's more spacious with huge sofa and Xbox360 + Kinect! The second room is smaller but with more privacy cox you can lock the room. We picked the smaller room cox we are shy like this LOL. You will be seeing the bear later on alot cox he's my best friend for that 3 hours :D And I bet you must be thinking I'm crazy to bring such a big bear there as my prop, AND YES I'M THAT CRAZY YO. The provide props and shoes there too! But I brought the balloons myself cox I wanted more of a sweet theme! The guy that helped us with the equipment there and within 5 minutes we are ready to shoot! Balancing the bear LOL . His head is too big .______. 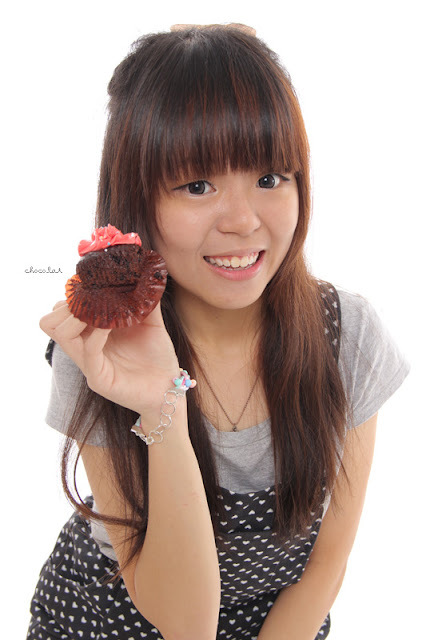 I bought along cupcakes for the props and my aim actually was to eat lah LOL. And if you're wondering what makeup I used , I only use BB cream + eyeliner + fake lashes from Daiso , but I think the lightings made my skin look pretty nice hahahaha. Cox I think don't look like me hahahahaha. So I've to hide my sunshine smile HAHAHA. I was really satisfied with my first set of clothes so I decided to take another set with it! THIS ONE LIKE FILMING CF FOR POPCORN HAHAHAHA. KFC can ask me advertise for them leh, Fingers licking good HAHAHAHA. And I actually hide the popcorn package behind me during the shot so when Mariam is testing out the lightings I can munch on them first hohohoho. The shots shown here are some of my favourite shots and at first I thought modeling was easy, but hell no okay my whole body is aching the next day LOL. Headed over to a cafe nearby after that cox we were all hungry after the shots and I will blogged about it in the next blog entry cox this entry is kind of long!